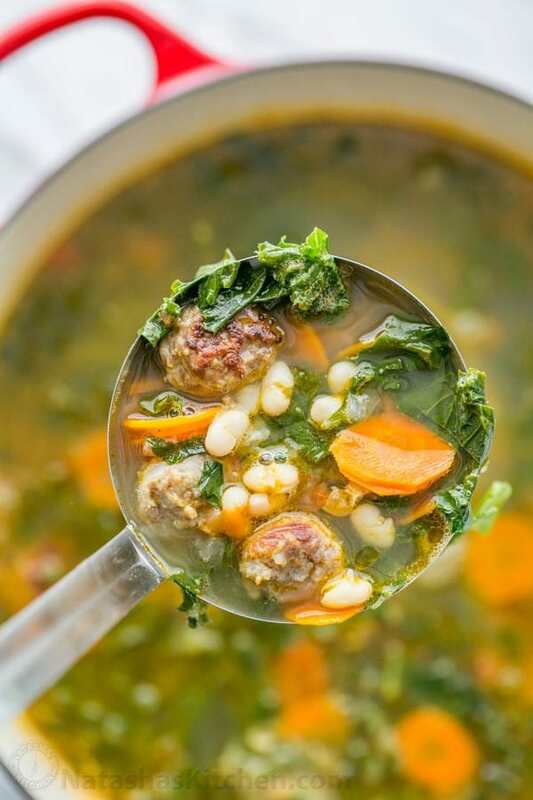 I’m a sucker for meatball soups so this white bean sausage and kale soup had my name written all over it! 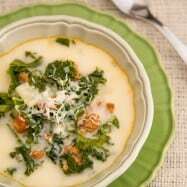 It’s wholesome comfort food y’all, plus it’s totally easy to make. Fall is soup season in our house. There’s something so cozy about having a pot of soup on the stove as the leaves change color and the air becomes crisp. It’s been kind of a weird baking week – baking is fun but it’s also a science that requires plenty of testing. Plus I’m terribly stubborn and don’t quit easily. Flops can be a real bummer (particularly when you’ve spent an entire day making a glorious looking cake only to cut into a crumbly disaster. 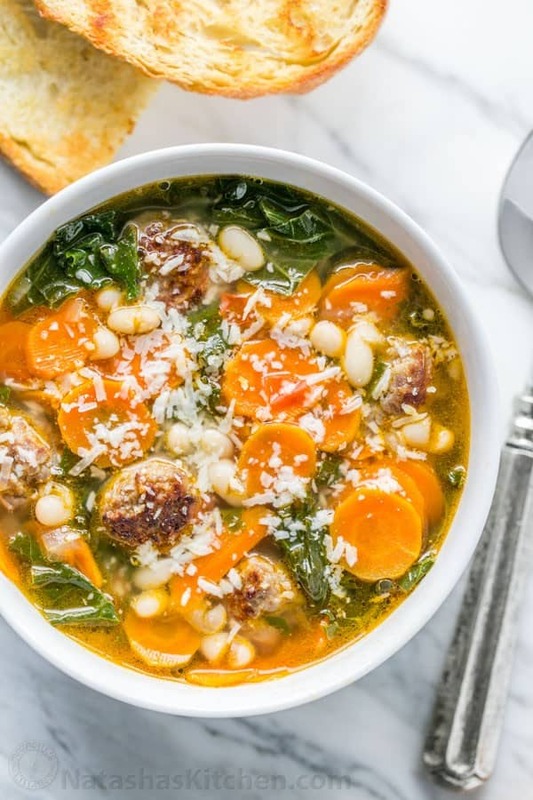 In the midst of my moping and being sprawled out on the sofa, I was flipping through an issue of Food Network Magazine (one of my favorite subscriptions) when I spotted Giada’s “House” Soup and I was like – YEEES! 1. Heat a large heavy bottomed pot over med/high heat and add 2 Tbsp olive oil. 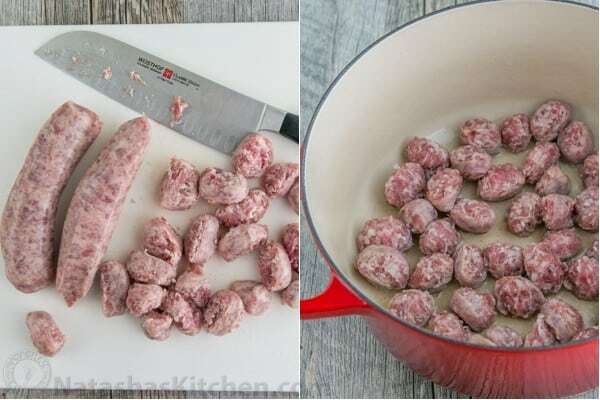 Use a sharp knife to slice sausage, add to hot oil and saute 5 minutes or until golden brown. I left the sausage skins on because it held the easy “meatballs” together, but you can peel it off if you prefer and just have clumps of sausage meat which would still taste great! 2. Add diced onions and sauté another 3 minutes. Add carrots and tomatoes and sauté another 5 minutes until softened. 3. Add garlic and stir until fragrant (1 min) then add 8 cups chicken broth and bring to a boil. 4. 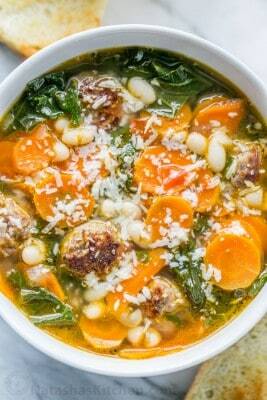 Toss in beans and kale and cook until kale is tender (5 min). Season to taste with salt and pepper (I added 1 1/2 tsp salt and 1/4 tsp pepper) then remove from heat. 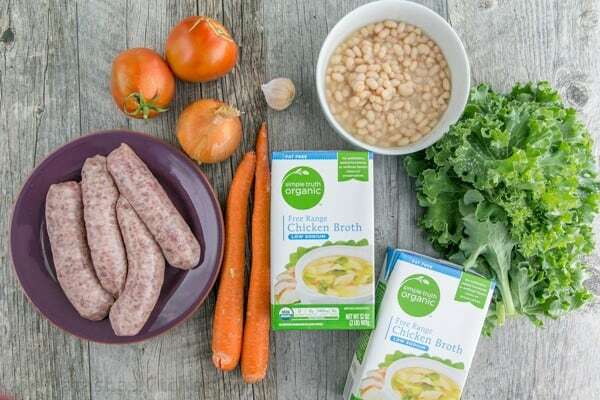 This soup is wholesome comfort food. 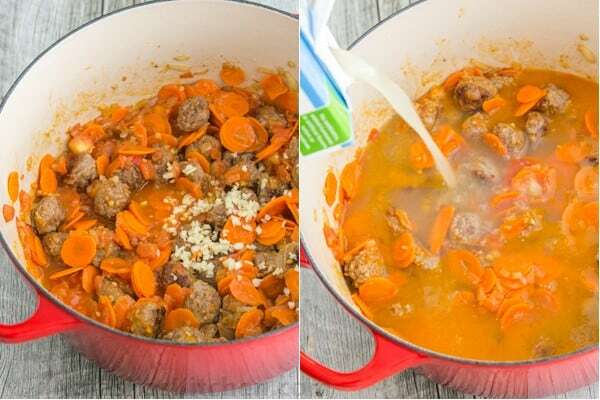 The sausages make easy fuss-free meatballs and they infuse the soup with great flavor. P.S. the parmesan - don't skip it! Heat a large heavy bottomed pot over med/high heat and add 2 Tbsp olive oil. Slice sausages and add to hot oil and saute 5 minutes or until golden brown. Add diced onions and sauté another 3 minutes. Add carrots and tomatoes and sauté another 5 minutes until softened. Add garlic and stir until fragrant (1 min) then add 8 cups chicken broth and bring to a boil. Toss in beans and kale and cook until kale is tender (5 min). Season to taste with salt and pepper (I added 1 1/2 tsp salt and 1/4 tsp pepper) then remove from heat. Serve garnished with parmesan cheese. I left the sausage skins on because it held the easy "meatballs" together, but you can peel it off if you prefer and just have clumps of sausage meat which would still taste great! 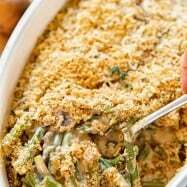 Enjoy with plenty of grated parmesan and toasted crusty bread. What’s your favorite Fall food? 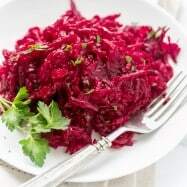 So this is the third recipe from your site that I have made, and each one has been spectacular. 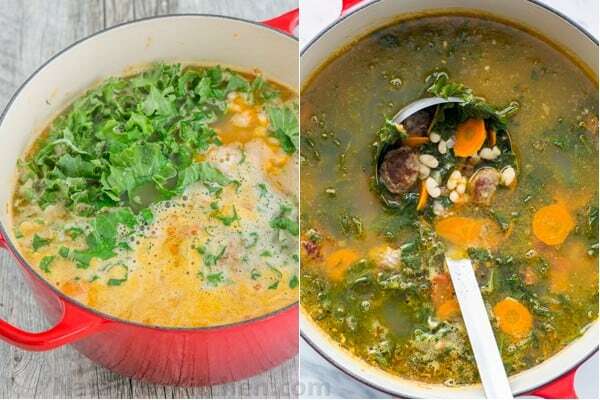 I’ve been in a soup mood as it’s been uncharacteristicly cold lately, and between this, the chicken and dumplings, and beef stew (I’ll be making the lamb stew someday soon as well), I believe I have a solid lineup of warming meals for the cold times to come. Other than some minor alterations (I used mild italian sausages, and vegetable broth for this soup) I followed the recipe as written. It was very simple to make and so good I couldn’t stop myself from having a second bowl. Also on the skin/no skin for the sausages. I’d recommend removing the skin and forming bite sized balls with the meat. When I make this again I’ll be forming the meat into 1/2″ balls instead of 1″. So, I just made this yesterday since it’s rainy season here and needed some comfort food. But I only had bacon on hand, so I made it with that. It was still delicious! 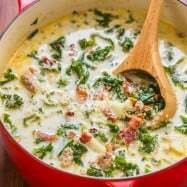 I’ve lost count of how many times I’ve made this soup and is still a hit and well loved by my family. Yeeeessssss girl! This recipe was bomb. I absolutely loved it. The flavor factor was truly great. I was so excited when you posted this new soup. Its refreshing. Served with some nice crusty bread! I’m so thankful for your blog. One of my favs. My husband is Russian and I’m African american. 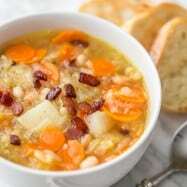 I didn’t know the first thing about an Slavic cuisine! I knew he missed home. I knew he missed soups and cabbage and his mama’s dishes LOL. I write his mother on VK and Google translate’s assistance but recipes really don’t transfer well when her measuring cups are actually her eyes. So when I found your blog and another girl’s I could finally fulfill his nostalgic cravings. My husband doesn’t eat pork so I used chicken sausages from Sprouts instead. 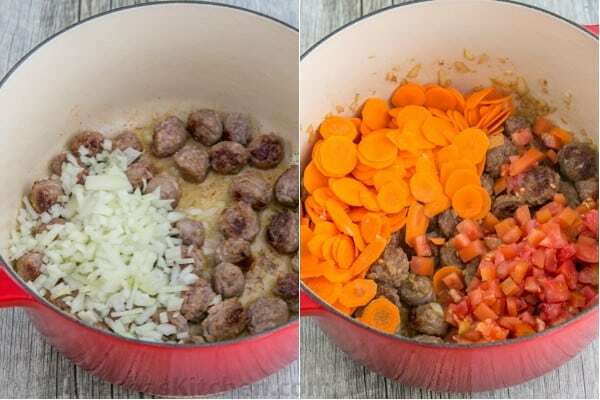 They were difficult to slice and came out messy… Any tips to slice sausage and cook them like the medallions you have? I used my sharp knife and a serrated one as well… The serrated slices came out worse. Maybe it’s the casings. 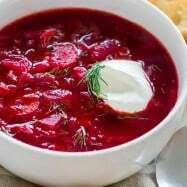 I love soup:) it’s so warming and comforting as the days cool off. Natasha I made this soup for dinner tonight, and everyone could not stop saying how good it is. My family absolutely LOVED it. ( I also added 4 potatoes), and it was yammy.